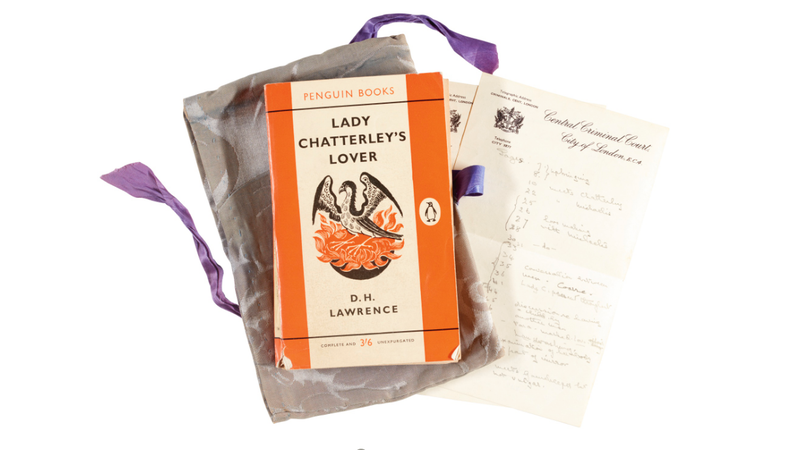 A real collector’s item for all the lewd, rude history of sexuality nerds out there: Sotheby’s is auctioning off the copy of Lady Chatterley’s Lover that belonged to the judge presiding over the 1960 obscenity trial that ultimately broke what you could publish in the U.K. wide open. Presiding judge Sir Lawrence Byrne’s wife, Lady Dorothy Byrne, read the novel for her husband, noting down the passages and pages that veered into sexually explicit areas – or, as she put it, “coarse” territory, or “love making”. She is also understood to have sewn the damask bag in which the copy was kept. Sotheby’s, which will auction the book, the notes and the bag on 30 October for an estimate of £10,000-15,000, said the blue-grey bag was “no doubt to prevent the press photographers from capturing the judge carrying a copy of the book”. Would truly love to have been a fly on the wall for nighttime discussions in the privacy of their marital bed about Dorothy’s reading. Within two years Penguin had sold 2 million copies of the book.